Our home has one really tiny linen closet and I have been brainstorming ideas to create a little more storage for the things that were overflowing out of the closet. Yes, overflowing :). 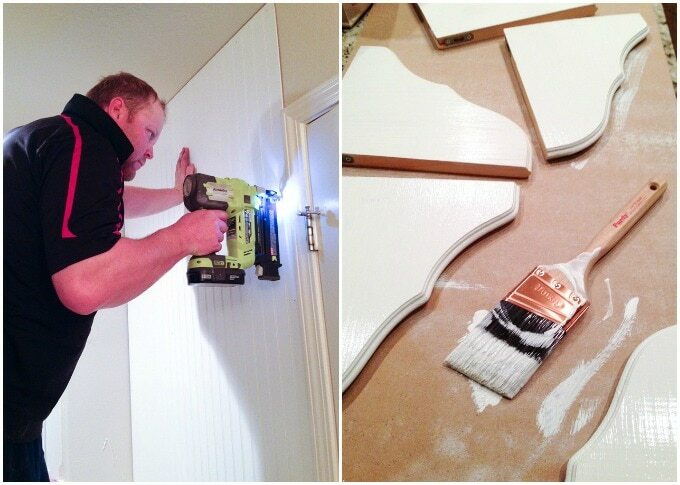 I had an idea of building some shelves in our master bathroom on a big wall over our tub and I was thrilled to be able to partner with Wayfair on the project. We absolutely love the look and convenience of the result! 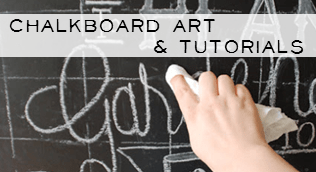 We added beadboard to the wall to make it pretty. Since this isn’t a typical linen closet, and it is always on display, I wanted it to be both functional and pretty. We had the hardware store cut the beadboard to size, and just used our nail gun to put it up on the wall. We marked our studs on the ceiling before we added the beadboard so it would be easier to hang our shelves later. I pre-painted everything and then just puttied and touched it up once it was hung on the wall. The shelf brackets were less than $3 a piece at The Home Depot and we used 1x10s for the shelves. It was SO quick and easy…. 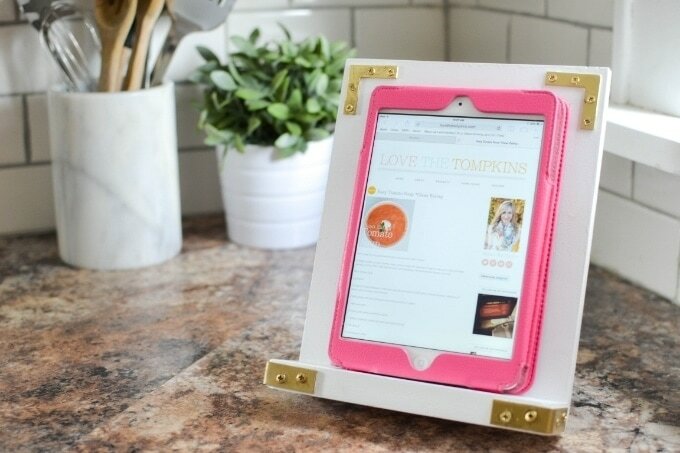 and the best part- the DIY woodwork part of this project cost less than $70 total! So much bang for our buck! I couldn’t be more thrilled with the result. 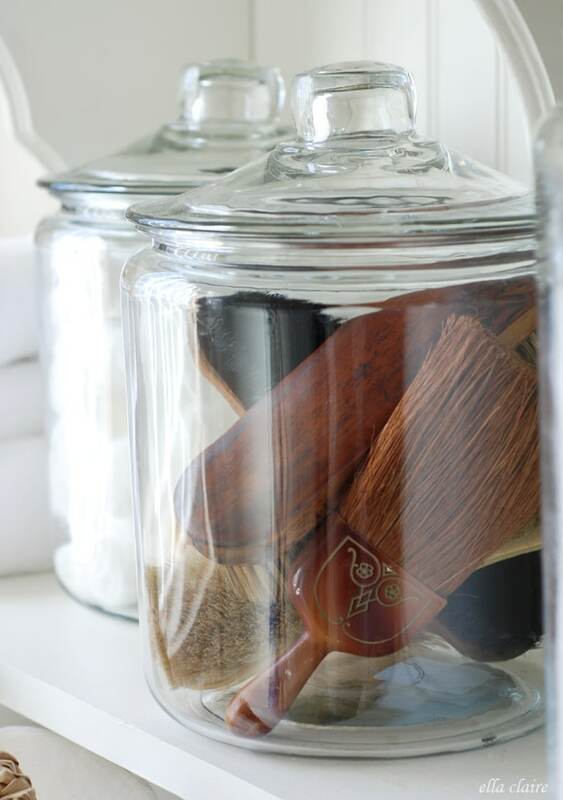 As with a lot of linen closets, we stored many of our everyday use items and a lot of extras- soap, cotton balls, cotton swabs, toilet paper, bath salts, body wash, bubble bath, etc. 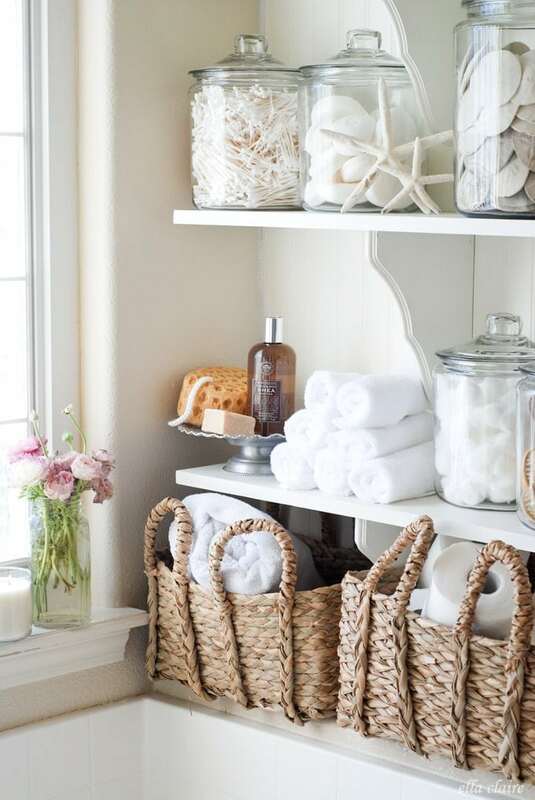 Of course we also use our linen closet to store towels and wash cloths. So you can see how quickly our tiny closet could overflow. 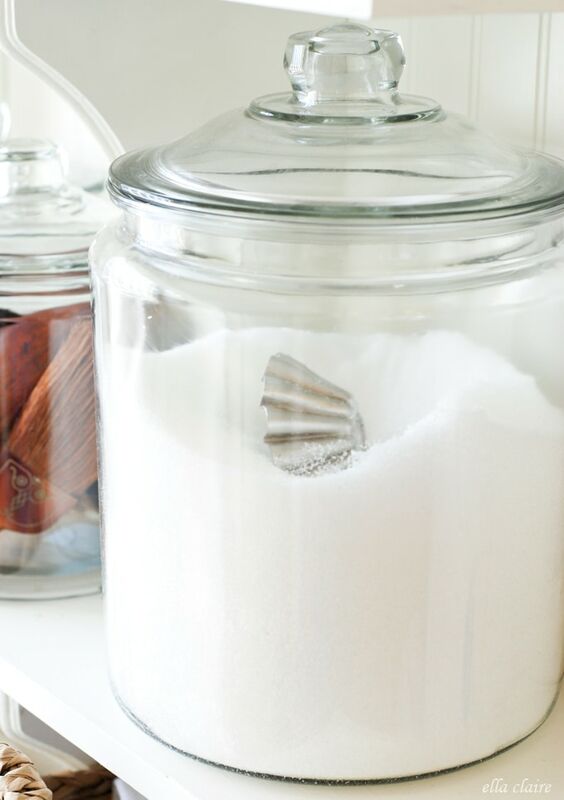 I took a lot of those items and put them into these glass jars from Wayfair. 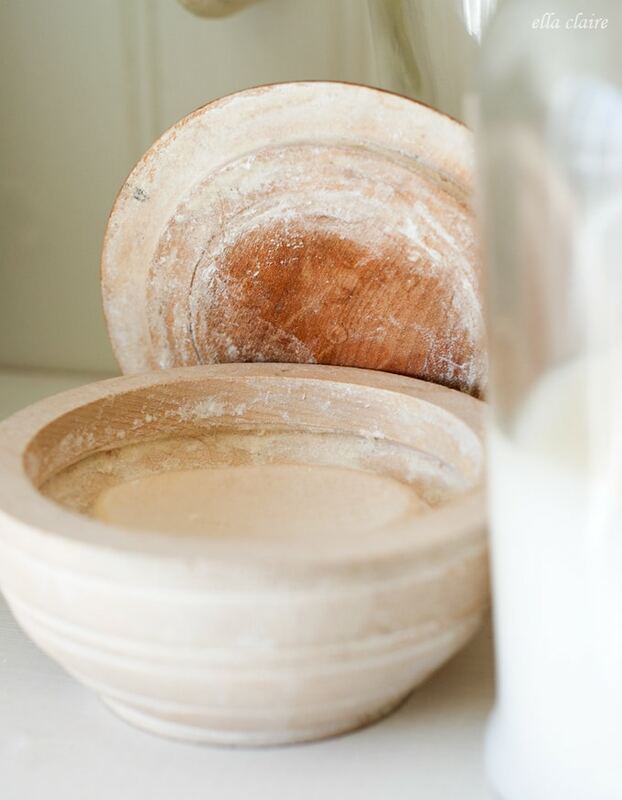 I think it makes even our simple everyday items look more collected and elegant. I went with a slightly beachy theme. We went on our honeymoon to the Oregon coast, and brought back some of these sand dollars. 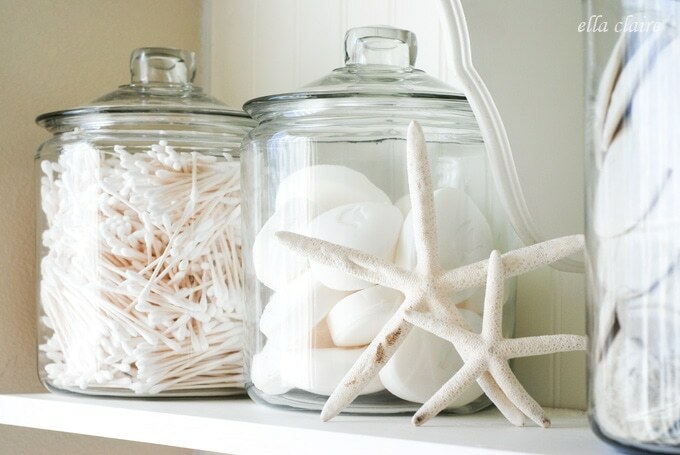 We love to go back to that beautiful place, so we collect a few each time we go and add them to our collection. Our linen closet is also on the completely opposite side of the house from our master bedroom, so creating these linen shelves made everything so much more convenient for us. 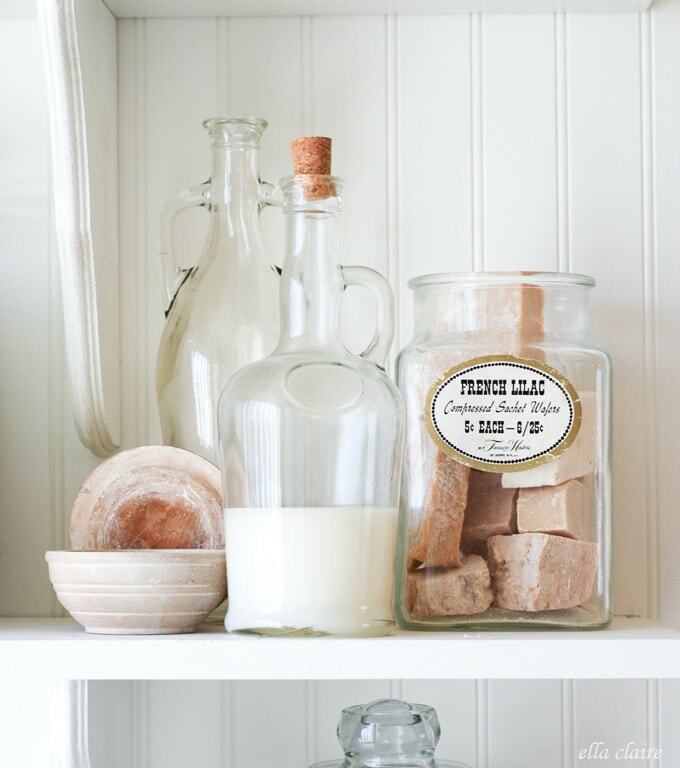 I also made some of our everyday bath items more easily accessible. I put the kids’ toys in the bottom of these Wayfair baskets, some bubble bath and body wash on the shelf, and our bath salts in a big jar with a vintage jello mold as a scoop. I included a few decorative elements here and there as well. I have this little collection of antique lint brushes that I thought would be really pretty in a jar. I think collections are so much more interesting when they are grouped together in one place. 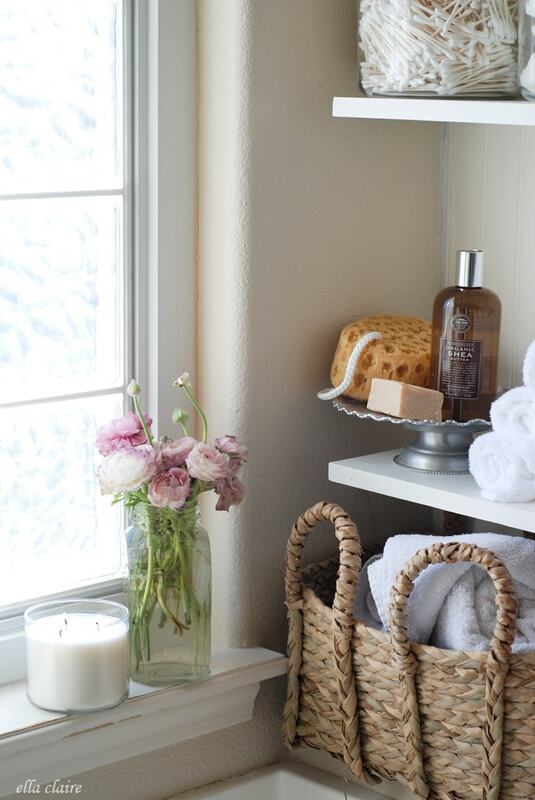 Of course, a new candle and fresh Ranunculus always make everything nicer too! Up until now, we didn’t really have a place to store extra towels close to the master bathroom and it seemed like we had them in piles in the most random places- our closet, the counter, next to the tub. 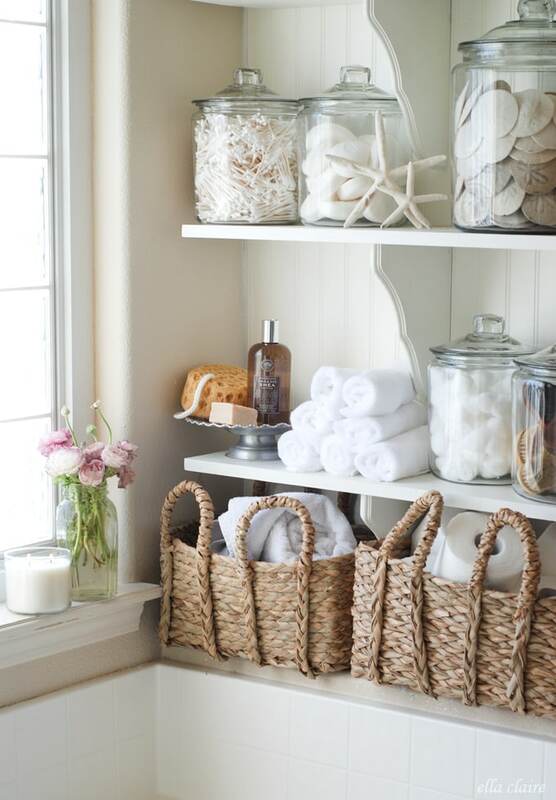 We love having the extra shelves, baskets, and hooks now for our towels now. 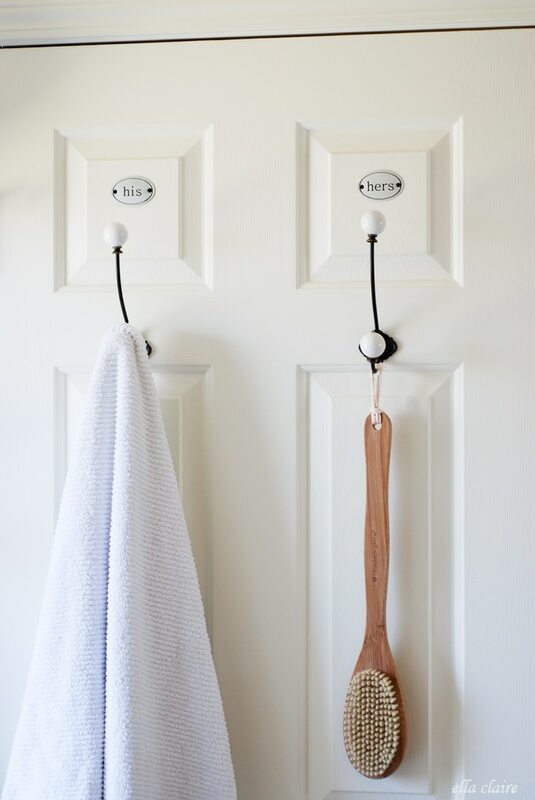 I found a little hook shelf last year that had tags on it with these adorable hooks. 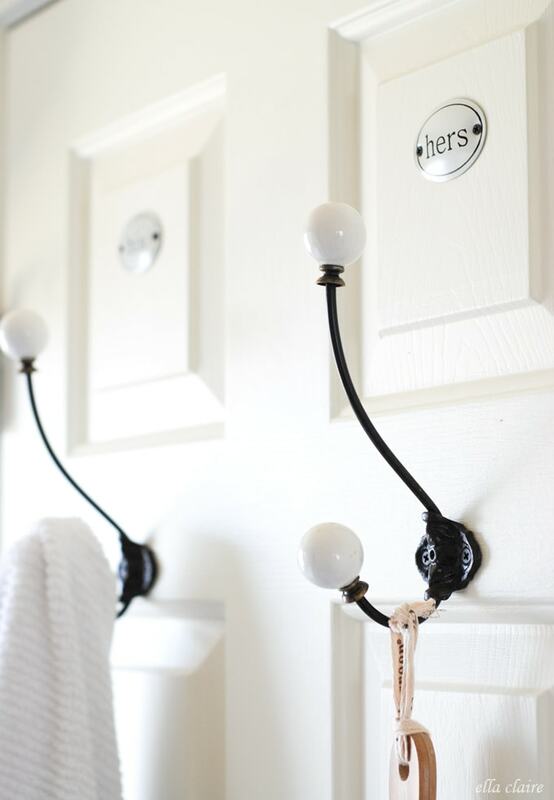 The tags said, “yours, mine, his, hers” so I used the his and hers in our bathroom. 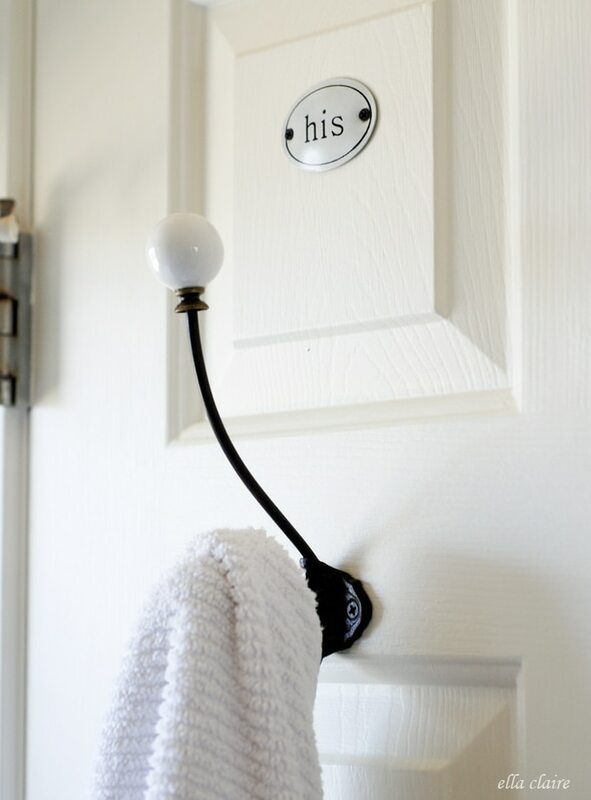 I had actually just bought it because I loved the hooks so much and wanted to use them somewhere, but I thought the “his” and “hers” tags were so fun too! There was just one dumb hook on the door before, and adding these quadrupled our storage (since they are double hooks as well). I love how much character they add! 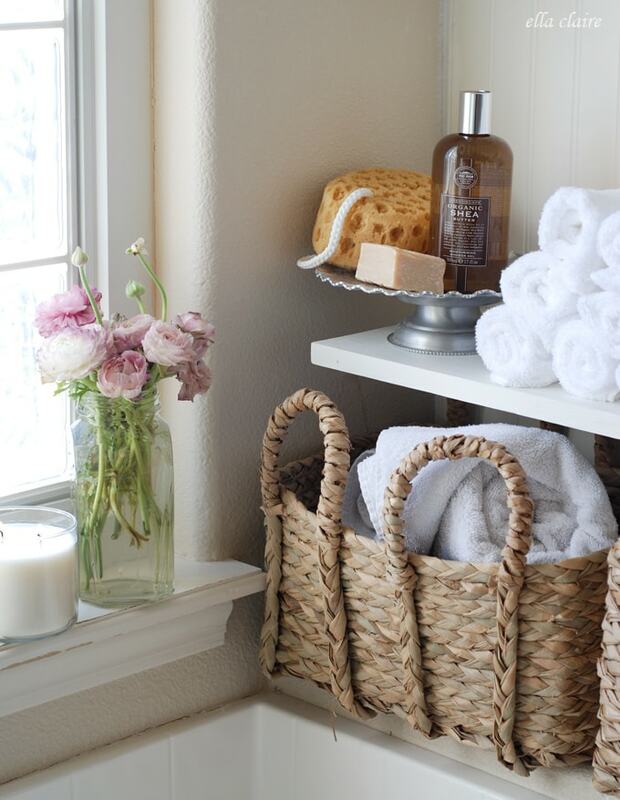 I wouldn’t normally think that toilet paper is in any way decorative, but I have to admit if toilet paper was going to look pretty it would be in these baskets! It is so convenient for us now too. I am still playing with the decor on the top shelf. We may just get rid of it and use the whole space for towels. I am not sure quite yet. We are enjoying this space so much now. It it such a relaxing space, but so practical too. 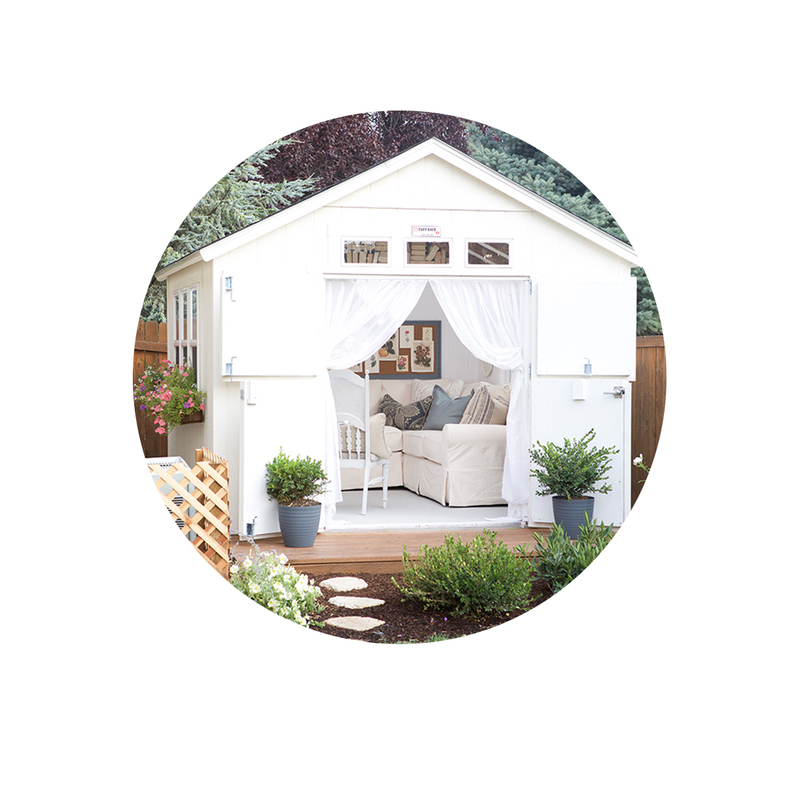 We love all of the extra storage and the convenience of having everything right on hand. Wow! I love everything about this. 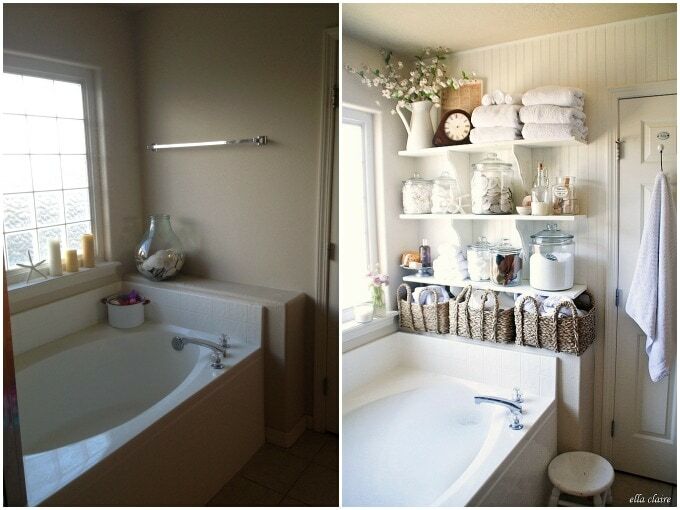 We will be renovating our master bath soon and I have the exact wall space by the tub. Thanks so much for the inspiration. It’s beautiful. Stunning! You and your Mister make quite an inspirational team. You’ve created a beautiful and functional respite that speaks of a high end B&B…or a very expensive bath & decor boutique! Niiiice! 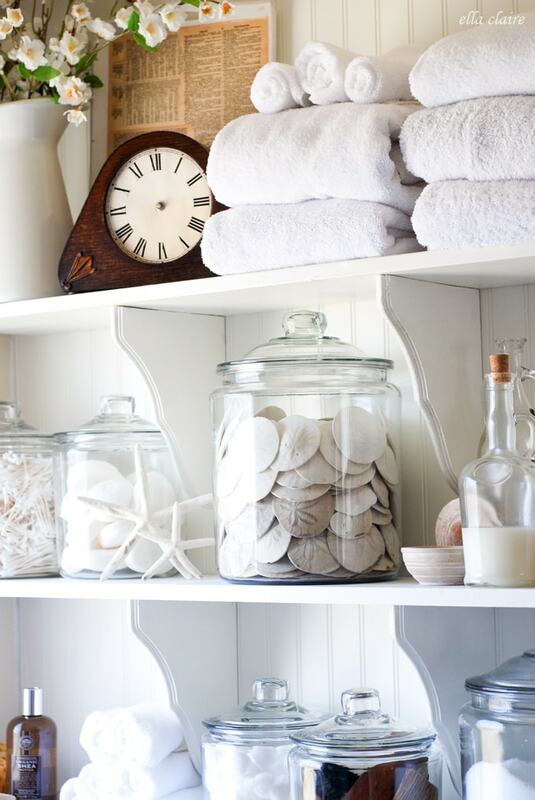 I just love organized clutter, so very English! Besides, I llke seeing all my pretties and collections, they make me smile everytime I walk past them. Great job, great idea. This is absolutely beautiful, Kristen. I love everything about it. 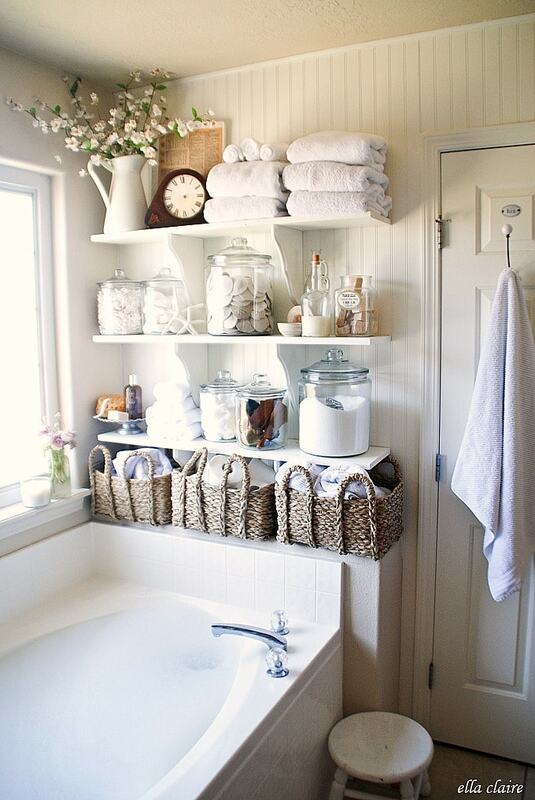 The jars and baskets are just perfect. Well done. But I do have to ask, we go to the Oregon Coast every year and I have yet to discover a beach full of sand dollars. You’ll have to let me know where you went so I can fill a jar up with some just like yours. LOVE! Whaaaaaat. I love every single thing! This is the best bathroom wall makeover I’ve ever seen! 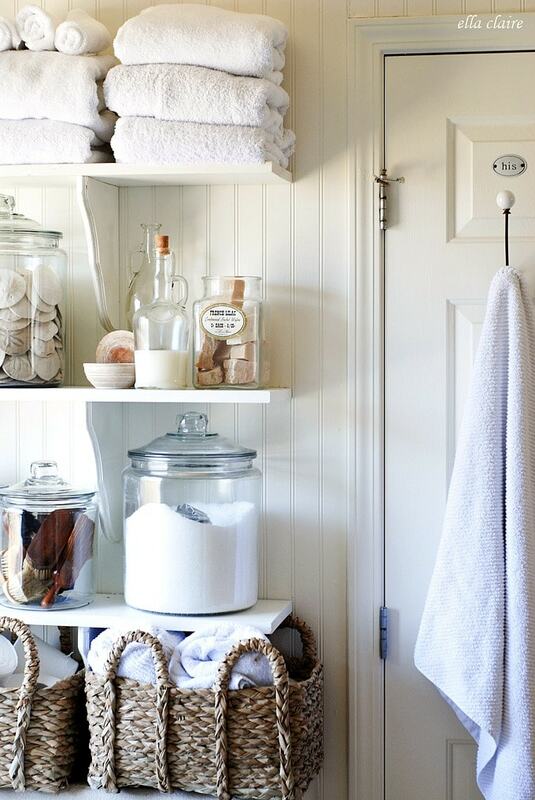 You are the queen of pretty open shelving! Gah! I’m so jealous of your bathroom! So dang perfect Kristen! I mean, this is stupid amazing!!! You guys did such a great job! And on a budget! Amazing!!!! Looks great and a bonus is all the handy storage. We have a large soaker tub in our master bath too. I had shelves on the wall but took them down. I decided to put them back up after I paint, but on the opposite end of the tub, closer to our sink. 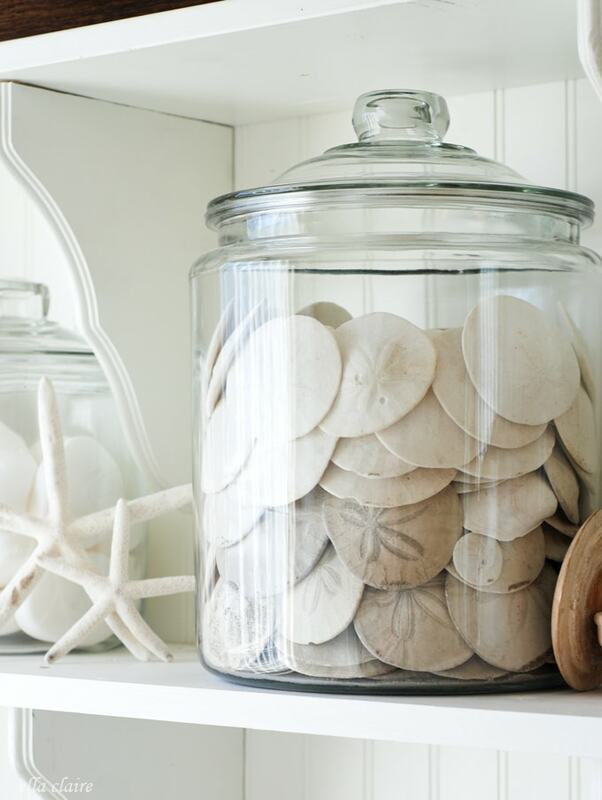 Your sand dollar collection is really pretty and I especially like all the neutrals. 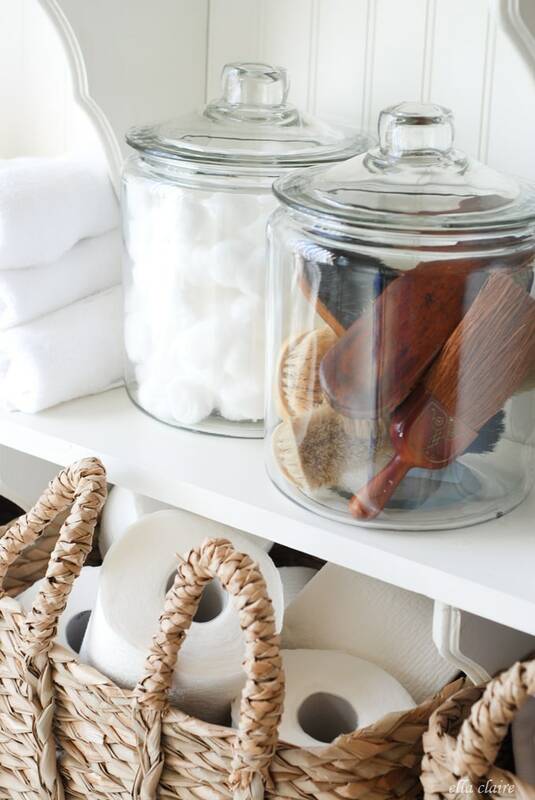 Your open shelves, and your whole bathroom, are amazing! 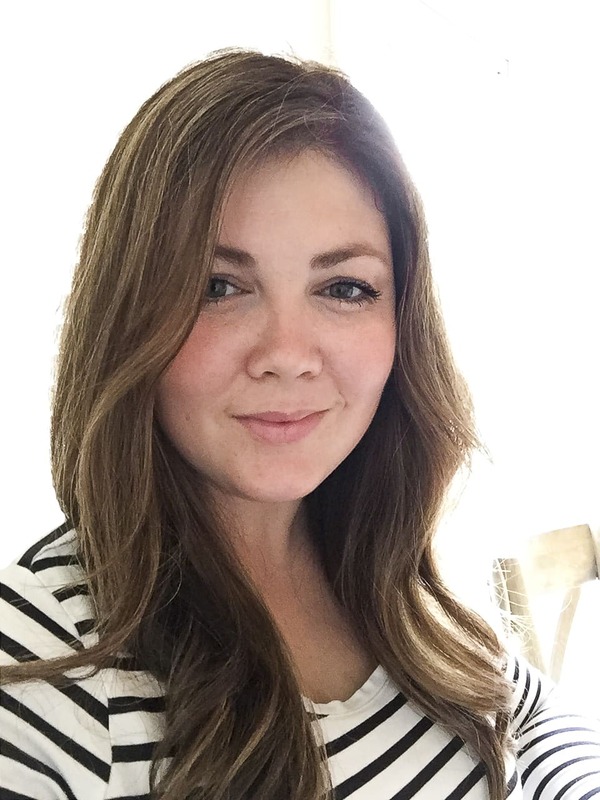 So glad I found your site through Rambling Renovators. 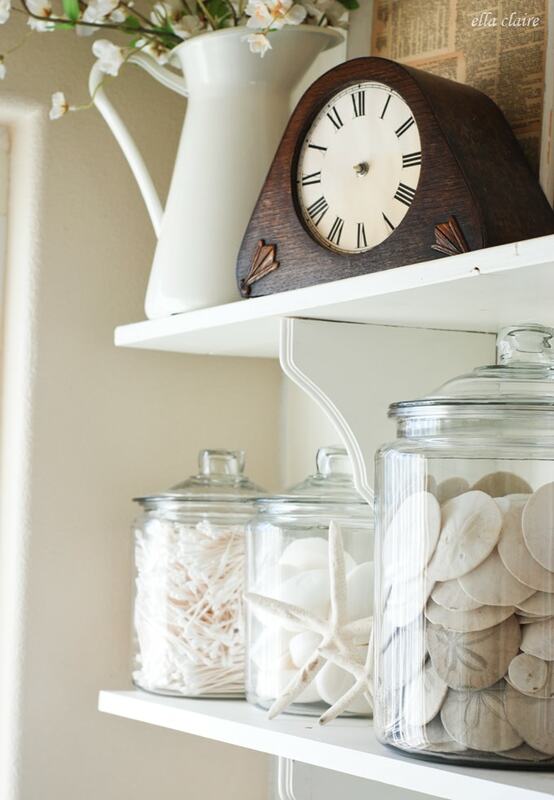 Love the shelves especially the jars filled with charming vintage finds! Great use of space! Very inspiring! !